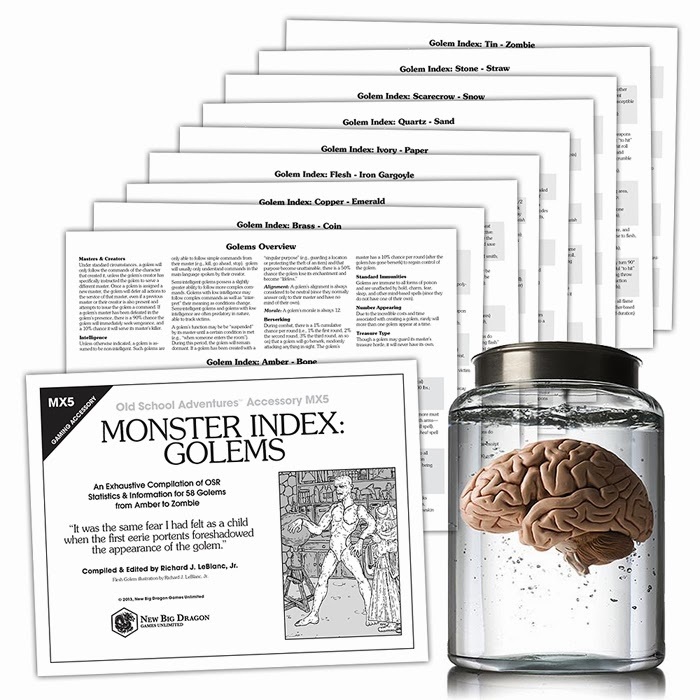 I know Halloween is not until next week, but here's a little something to get you in the mood... a Monster Index of Golems! So before I get into it, a note: The same day I previewed the illustration for this index, Mike Monaco blogged about Frankenstein's monster not actually being a flesh golem (at least not in the original book). If you're relatively new to this blog, and unfamiliar with these Monster Indexes... what I attempt to do, is put together a fairly exhaustive list of monsters that have a great variety of types (like lycanthropes, or giants, or spiders, or snakes), and present the monster info in a stripped down presentation that can be easily adapted to Oe, BX, and 1e (sort of like the old Monster & Treasure Assortment books did). Sometimes, the variants come from newer editions (particularly 3e and 3.5e), but I always try to infuse any newer creatures with an old-school vibe. So today, you have at your fingertips a resource of 58 golem types, including the requirements for creating them (spellcaster type and level, materials cost, and spell knowledge required). The other stuff is there of course (HD, Attacks/Damage, and the like). Old-school Adventures™ Accessory MX5, Monster Index: Golems.